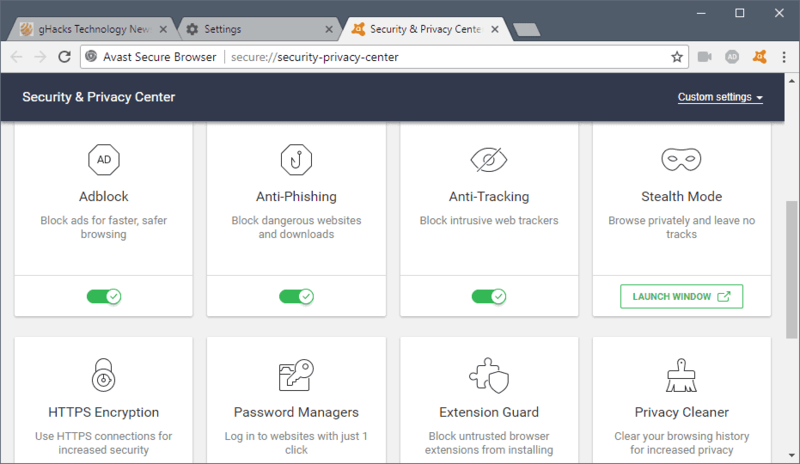 Avast Secure Browser is a free Chromium-based web browser by security company Avast that is advertised as private, fast, and secure on the official download site. The web browser is the official successor of Avast SafeZone Browser which Avast discontinued some time ago to focus development on the new browser. We will take a close look at the web browser in our review; you will learn about installation and use, functionality that it provides, and whether the fast, secure and private promise is kept. 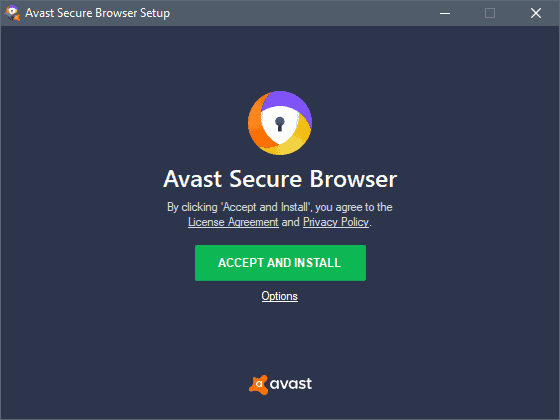 Avast Secure Browser is available as a standalone download for Microsoft Windows and also as part of Avast's security products. You find the download link in the summary box below the review. SafeZone installations will be updated automatically to the new browser. Place a shortcut on the desktop (yes), taskbar (yes), and in the start menu (no). Launch the browser when the installation finishes (yes). Import bookmarks and settings from my current default browser (no). Import cookies from my current default browser (no). You need to check the import options if you want to import bookmarks, settings or cookies from the default system browser. Note that the import function supports imports from the default system browser, and that the import will fail if the default browser is not supported by Avast (example: if Pale Moon is your default browser, imports will fail as it is not supported). Note that the browser supports the importing of bookmarks and settings from other browsers after installation. Just load secure://settings/importData at any time to configure the operation. Supported browsers are Microsoft Edge, Mozilla Firefox, Google Chrome, and Microsoft Internet Explorer. You may import from a bookmarks HTML file as well. Note: Avast collects and sends usage statistics and crash reports to company servers automatically. Users are not prompted about this during installation. You may disable the collecting and sending on secure://settings/ under privacy and security. Avast Secure Browser is based on Chromium, the open source part of Google Chrome, Vivaldi, Opera and other Chromium-based browsers. If you used Google Chrome in the past, you will feel at home right away as the interface resembles that of the browser. You will notice some differences though as well as Avast's browser comes with several built-in browser extensions. Three extension icons are visible in the browser's toolbar that provide video downloading and ad-blocking functionality and a link to the new Security & Privacy Center. Adblock -- an ad-blocker powered by uBlock Origin. Supports third-party filter lists, custom rules, and whitelists. Avast Secure Browser users may disable or enable extensions but it is not possible to uninstall any of them. Security & Privacy Center is another feature of the browser that is a unique feature. It is a control interface to enable or disable built-in features, and is used by Avast to list company products that complement the browser. You control the ad-blocking, privacy, HTTPS encryption, and password manager extensions from the Security & Privacy Center, and new tools that are not listed as extensions. Anti-Fingerprinting (disabled) to block or limit fingerprinting for tracking purposes. Anti-Phishing (enabled) to protect against phishing attempts. Extension Guard (enabled) to block the installation of untrusted browser extensions. Flash Blocker (enabled) to block all Flash content. You may launch a new private browsing window (called Stealth Mode) and a Privacy Cleaner (clean browsing data) from the Security & Privacy Center as well. Avast's browser lists the installation status of Avast Antivirus, Bank Mode and Avast SecureLine VPN at the top of the page. Download links are provided when products are not installed; the links redirect to the Avast website. How fast is Avast's Secure Browser? My initial assumption was that the browser's performance should be more or less identical to that of Google Chrome and other Chromium-based browsers. I ran tests using stable versions of Firefox, Chrome, Edge, Vivaldi, Opera and Avast Safe Browser. Benchmarks are linked; feel free to give this a try on your end and report the results in the comments below (Basemark and HTML5 Test: higher is better, Ares: lower is faster). The benchmark results show that this is indeed the case. The small score differences between Avast Secure Browser and Google Chrome are not significant; expect the same performance in Avast's browser and Google's browser. To sum it up: The performance of the web browser is excellent. It is as fast as Google Chrome in benchmarks and that carries over to real-world usage as well. While you won't see a five times performance boost when you compared it to Mozilla Firefox, it is an area that the browser does really well in. One of Avast's main promises is that Secure Browser protects user privacy better than other browsers. I decided to run tests using the default configuration and with all privacy features enabled. Panopticlick by EFF stated that Avast Secure Browser offered "strong protection against Web Tracking" and that the browser did not have a unique fingerprint (in both configurations). Other privacy tests highlighted that the browser's protection was not perfect but still better in many cases when fully enabled. The test on Maxa Tools, for example, listed the number of installed plugins, the device's IP address and the location based on the IP, as well as other information. A rerun of the test with fingerprinting protection enabled did not improve the results. You may see some improvement depending on which test you run and whether you connect to Avast SecureLine VPN, but the same can be achieved with any other VPN as well. To sum it up: Avast Secure Browser comes with built-in functionality to protect user privacy. While that is good overall, it does not offer 100% protection against all forms of invasive data collecting or fingerprinting. 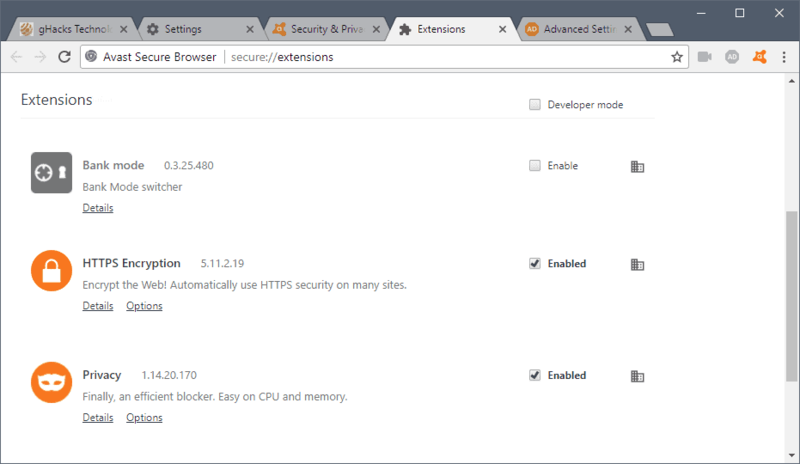 Avast Secure Browser is a brand new browser that is based on Chromium. The browser is fast and comes with privacy enhancing extensions and settings that do improve privacy up to a point. The fact that usage statistic and crash reports sending is enabled by default damages that somewhat; I'd expect a prompt from a privacy-focused browser during setup that asks me whether I want to enable the send-home functionality or not. Another negative is that you can't uninstall extensions that the browser comes with. Disabling may work for most users but if you like a clean browser, you may not like the sticky nature of all default extensions. Avast is off to a good start with the new browser. It offers better functionality than the company's SafeZone Browser and does well in benchmarks and other tests. The company needs to publish regular updates to not fall behind the Chromium release cycle and leave security issues unpatched for too long after patches become available. It is too early to tell whether Avast is up for that. I'll revisit the browser in a couple of months and keep an eye on it in the meantime to find out more about that. Now You: What's your main web browser right now, and why? I don’t trust any “Secure” Chromium derivatives. It’s a test, designed to provoke an emotional response. Avast was always one of the companies pushing its user to download Chrome . . . now they have their own browser (based on Chromium)? No thanks. I’ll stick with Pale Moon. Avast’s browser comes with several built-in browser extensions. How often haven’t I received emails which included the sender’s Avast logo retrieved from Avast servers, offered as an opt-out option for Avast users and often never unchecked. Need to say Avast, in my view, is one of those companies trading users’ privacy for their security? If I have a look on the blacklist I use with dnscrypt-proxy, a list built from several, the number of entries including “avast” is amazing. So amazing that I’m bound to include *.avast. * to catch all avast urls. Such company behaviors irritate me and, when performed by so-called security firms, revolt me. Avast, why don’t you move off? Tom, thanks very much for this! I hadn’t caught that yet since Avast took over CCleaner; thanks to you I have that blocked now. Thanks again! I didn’t realize CCleaner is owned by them now. I’ve been using Avast for years but every update comes with some annoyance. Just today the browser decided to auto install without my permission. What are some products would you recommend for antivirus, registry cleaner, etc.? I’m a month late but I appreciate the information you’ve given so far. For free AVs, Panda Free Antivirus is a great “set-it-and-forget-it” AV with, at last check, an extremely high detection rate. At the other end of the free spectrum, Comodo makes a free AV which, like many of its products, is, shall we say, more complex… Depends on what you like. There are many other choices of course. Gizmo’s freeware site should have a list and reviews. For paid AV, I like Emsisoft. It has two detection engines, one is their own, and the other is from Bitdefender. Bitdefender also makes what many think is the best paid AV out there. I am also inclined to be positively disposed toward F-Secure. You may find information from an organization like AV Comparatives, etc., helpful. For registry cleaner, I would say that this is really not necessary. You could go your entire life without using a registry cleaner–and most people do–and be fine; on the other hand, an inadvertent screw-up with a registry cleaner could really cause some harm. “CleanAfterMe allows you to easily clean files and Registry entries that are automatically created by the Windows operating system during your regular computer work. You can get it at nirsoft dot net. You might also have a look at BleachBit. I haven’t used it, but Martin reviewed it here on ghacks on February 28, 2018. You can do a search here to read his review of it. Tx for your comment on ghacks.net. I believe many people aren’t aware of the tricky methods computergigants use to get their information they need to manipulate the users and to get more profits. I removed immediatly Avast and CCcleaner from my device. At least I do not have to worry about them. What worries me also is that these firms are focussing their arrows on the alternative OS. This can mean a threat for the free software in the future. You’re very welcome–thanks for saying so! I stopped using Avast many, many years ago, but I still use CCleaner 5.43 Pro, but keep it blocked in my firewall, and have not a single problem or complaint. By “alternative OS” I wonder if you mean Linux…? I’m pretty sure that Tor browser is more secure. But, for Chrome fans this might be interesting. I don’t trust them since they locked turning off scanning statistics behind subscription – no idea if that policy has changed, I’m not interested in their products anymore. I hate it when comparison table don’t explain the numbers. Smaller better? Bigger better? Right, sorry for that. I have added the information. So a Chromium+HTTPS Everywhere+uBlock+some tweaks+rebranding browser from a company that collects browsing history using its “free” antivirus? Color me surprised! I use Firefox as the primary browser and SRWare Iron as a Chrome browser, with the usual adblock and security plugins. SRWare Iron doesn’t phone home to Google servers and there are no forced updates. Also have Opera installed but have rarely used it since the proxy went downhill. Do you mean gfx.webrender.enable = true? Any hiccups? The time it takes to get the comments published is likely relevant of a deep comments’ section problem; time is maybe why I recall the above mentioned. Why not let Ghacks spare 24 hours for the site’s maintenance? Repairing/improving simultaneously to managing incoming comments must be a hell of a work. This is becoming truly weird. Hello Tom! This is an aside: it seems like it’s been awhile since I’ve seen you on here, and I wanted to thank you for the Bergson! It’s been so long since I thought about him or came across him, and I thank you for reminding me that since many years ago I have wanted to explore his works more deeply. Thanks again for your comment! Remains that a philosophical approach is less incentive of passion deployed by religious and political comments, it allows to think and express our thoughts more accurately (we often think correctly but miss the step to express those very thoughts accordingly, with the former in 3D and words in 2D, a problematic similar to flattening a half orange : at one time you’ll lose part of it). I remember smiles when Arthur Rubinstein — the exceptional pianist — answered to “Why do you always reply to a question by another question?” by “Why not?” : besides humor this was highly philosophical : questioning the question is the basis of philosophy! It takes a special person to add soooo much brilliant color…to logic. You are indeed, one of the most quotable commenters on Martin’s site. Martin, I notice at the moment the top of the article shows “13 comments” and there are in fact 15 comments at this time. 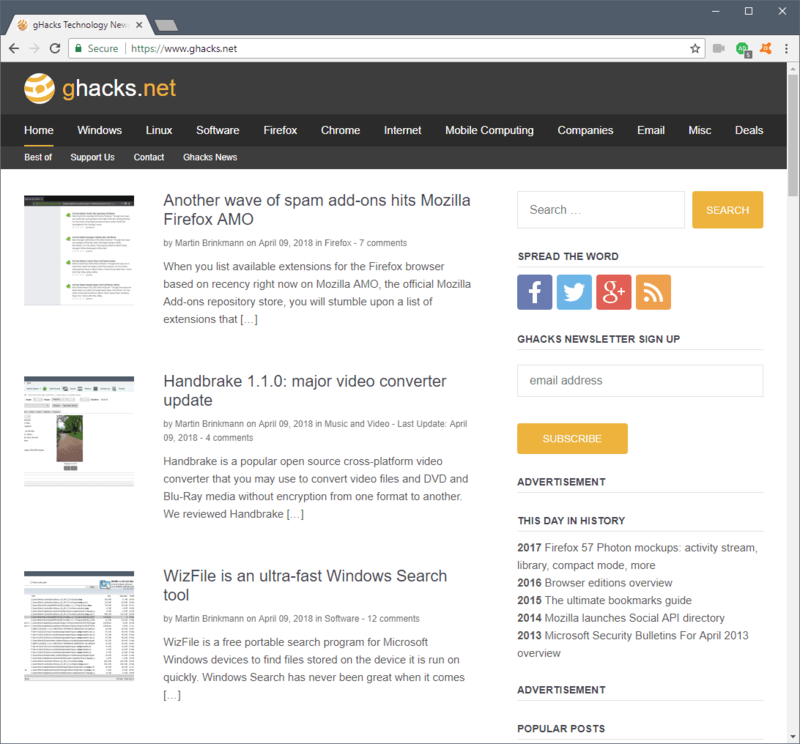 I very briefly tested Avast Secure Browser before I saw Ghacks very impressive review. My thanks for testing better than I ever wood. I tried Avast SB primarily because I switched to Avast IS a few days ago and wanted to see how SB integrated with IS. My default browser is Chrome 64 beta because I like to stay ahead of fixes when they are applied in a real beta by old school standards, and I only had to revert to stable once with Chrome beta. Your point is well taken whether SB will stay current with chromium; I do not use Opera much because of that concern. I look forward to your further comments about SB in the future, as well as the user comments at the bottom of this informative analysis by Martin. Opera (on Desktop) usually stays up to date with Chrome. There are reasons to be suspicious regarding Opera, those have been beat to death here, but they typically do really good job of pushing out Chromium security updates alongside Chrome. Is it fully open source? How come your firefox only scores 90? I got 270 on my i5-4460 with many other applications running at the same time. How much did Chrome score on your device? My Vivaldi scores 362 and Opera scores 313. All browsers are the latest versions. Benchmarks depend on the computer you run them on. You can’t compare results between computers usually. I find the Firefox result to be very low as well but I ran the test in Nightly and in Firefox Stable, and both had about the same score. Another generic Chromium based browser without value. Waste of time! That Chromium spawns are duplicating like poisonous mushrooms… Pure cancer! isn’t competition good for us? i for one welcome as many Chromium cousins as possible. otherwise Google will push built in fake-adblock and other problems much faster. There is little point in reasoning with angry people. It does say a lot about the chromium base when vendors prefer to use it to create browser spins like this. But could not the same be achieved by using chromium and adding extensions.?. It does seem an easy route to just use chromium and slap modifications on top.Vivaldi etc have done the same. Firefox seems to be the only browser lately which has had a genuine makeover. You are right, chromium + extenstions work fine. But in the real world average user doesn’t care about extensions, and in 99% user will use browser without/with preinstalled extensions. And browser distribution with preinstalled extensions may be a big deal. I’m on Linux, so…. But the last time I used Avast products, I was rather disappointed with the direction they were heading. I also can’t forget the fact that Ccleaner was attacked only days after going to Avast servers. From my own personal experience with Avast products, they are not to be trusted at all. I won’t touch their browser. Another Chrome based browser is IronBrowser, they have by default turned of all phone-home stuff and apparently done some code changes to keep it a bit tighter, worth checking out. Not a viable option and iron does not offer anything which cannot be done with chromium itself. The wiki article on this browser even states it is scareware plus the code is closed source. I really do not see the point in the iron browser and research on the web proves my point entirely. The present Brave for laptop/ desktop is buggy on my machine. I am hesitant to try this new product. Skeptical!! Still mad at Avast for doing away with Safe Zone which I used for financial sites. They did not tell us they did away with it until I renewed and the new version was minus SZ. What do we use now that is safe for online financials? I run Firefox and use the net for basic stuff and financials. Any suggestions? Another suggestion would be to use a program which specifically protects against keyloggers, such as a program like KeyScrambler from QFX Software, SpyShelter, Zemana, etc.. These keystroke encryption/anti-keylogger programs can help prevent your passwords and account numbers, etc., from being stolen if your computer should ever become compromised. Of course make sure that you are running regular frequent complete scans with your security product, such as Avast, etc., as well. Hy, thank you for your reply. I will make sure I am doing all of what you say. I appreciate you. BW, you’re very welcome :) I understand the frustration with renewing and finding out Avast did away with SafeZone. Avast may have done that because of the serious security flaw that was discovered in SafeZone. 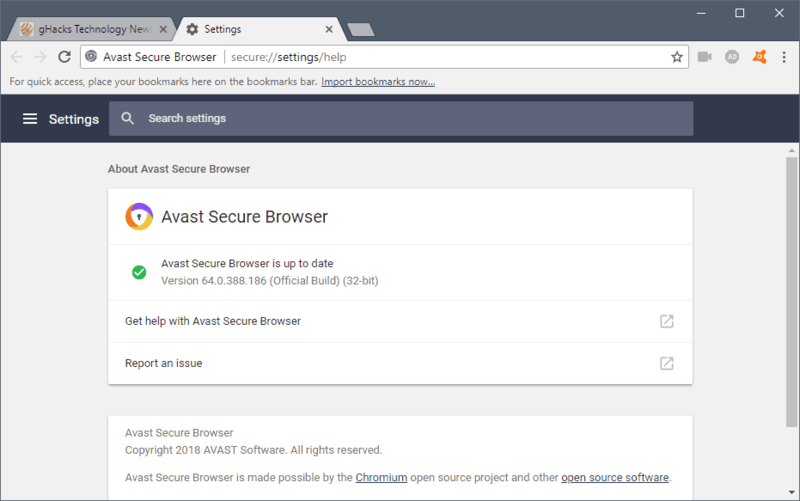 Avast may have wanted to get a known insecure product off the market so it couldn’t be used to exploit users, and then it took them some time to get this new Secure Browser ready for release. So it may be worth a try for you, and then you can decide whether Avast Secure Browser or Firefox works better for you. Good luck! BEEN USING AVAST SECURE BROWSER FOR THE PAST FEW WEEKS, SEEMS OK BUT I WOULD LIKE TO ADD THE CHROME EXTENSION ‘GOOGLE TRANSLATE’ BUT UNABLE TO DISCOVER HOW TO ADD AN CHROME EXTENSION. IF IT CAN’T BE DONE THEN THIS BROWSER IS GONE. Go to secure://security-privacy-center/ and put “Extension Guard” off. Because I use Avast for my computer security I got Avast safe zone for free. Avast has changed it to Avast Secure Zone, and loaded it onto my computer without asking. Lost all of my shortcuts. Browser is very glitchy with fragmented letters. Can’t put more than eight new shortcuts on screen. When you try to close a tab it closes intire browser and sends you back to desk top. Tech help is totally useless. A bunch of Indies I can’t understand. Probably because they really don’t want to hear from anybody. I am going to start looking for new antivirus softwear because I am tired of Avast putting things that don’t work on my computer without my permission. Can anyone help me find a way to re-install the MENU BAR at the top of the screen please? I have searched everything in Avast Safety Browser and there is no ability to turn on the Menu Bar and I often need that to save individual pdf files as they come down through the browser. Sorry; I have removed all AVG and Avast products from my system for various reasons that may not be generic for everyone. This thing installs itself like Malware! I prefer Google Chrome but after adding ram, it still sucked resources. So I tried Avast Secure Browser after being a paid AIS user for about 20 yrs, not sure about this I think I see why it’s free. Not crazy about adding extensions but the browser stopped translating (had to dwld Google Translate) after numerous emails & a screenshot a tech was able to tell “we have a problem & you are correct, it doesn’t work.” Umm, really now??? Then I can’t access my banking page (Netspend.com, never loads). Was told to start shutting off security features starting with “do not track.” Bottom line, this should have made it out of Beta testing!!! Oh dear! Having read all these comments, I am bemused and have no idea who can be trusted. Is it safe to leave this comment? Several AV systems crashed my Windows machines and AVG, then Avast, seemed better, and the Avast browser seemed better than Google Chrome, being quicker, and much better than Windows’ offerings. Am I deluded? I have been using Avira, Avast and AVG without any issue, actually remarkably fast and secure apps. Explorer and Edge have been annoying but chrome remained my “favorite” because of more relevant results, speed, and support of extensions. Avast is now hijacking browsers. When i uninstalled they left me with internet explorer links all over my desktop. Ridiculous. Now Avast is nothing but Malware!